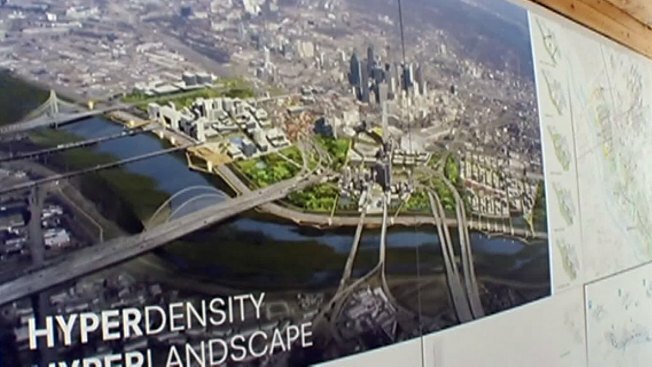 Grand ideas to reconnect Downtown Dallas with the Trinity River are now on display in a design competition dubbed The Connected City Design Challenge. The final presentations from three teams of city planners are posted inside a shipping container, which was open to the public outside Dallas City Hall on Wednesday. A panel of judges will decide on Dec. 20 which plan best uses the land area between downtown and the Trinity River. Leslie Nepveux, with the Dallas City Design Studio, was stationed inside the shipping container Wednesday to answer visitor questions. "There’s no promise of any work being built, but we’re trying to get the city to start think[ing] about what could happen and the possibilities that could happen," Nepveux said. The winning plan will only be a recommendation for future city land use, planning and private property owner projects. Some property owners along the river are already working on plans for large mixed-use developments of the sort envisioned in the proposals. The area now includes the Dallas County Jail, bail bond offices, liquor stores and gas stations along Riverfront Boulevard. "It's not a desirable place to walk through, or go to, so we're trying to talk about what could happen to make it a desireable place," Nepveux said. The competition proposals are posted online where visitors can also cast their votes for the best one and learn where the shipping container with posted plans will next be on display.